P. Senthilkumar - Dance. Dance Classes. The benefits of learning any of these disciplines of dance are two-fold: physical and mental. This is because Indian dance connects the two. Students improve their body control, develop their sense of rhythm, learn to express themselves through body language, get physically fit and develop a general sense of well being - all while getting to know a new culture and having fun. Which style of dance is suitable for me? Contact Me to arrange a class or workshop (Bharatanatyam, filmdance, folkdance, dance theory, nattuvangam, carnatic music, choreography, silambam). No class on 29.9., 27.10., 3.11., 8.12. (holiday) - see my Calendar! It is essential to wear comfortable clothing which allows free movement. All dances are danced barefoot. 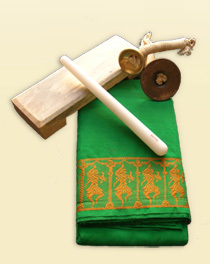 For advanced students in Bharatanatyam the so-called “practice sari” with blouse and pants is common. Training in the Bharatanatyam, the classical Indian dance, starts with learning the basic steps and movements. Full Bharatanatyam training generally takes several years. Stamina and coordination of each body part from the tips of the toes to the eyes are slowly built up, as is a basic theoretical knowledge of the dance. Only advanced students can make it through an entire choreographed dance, but anyone can learn this type of dance – even complete beginners shouldn´t be discouraged. This style of dance is suitable for you if you like to delve into something with your heart and soul, if you´re interested in Indian mythology and if you’d like to explore Indian culture on a deeper level. After learning the first basic movements in the Folk & Filmdance class, you will immediately learn choreographed dances. In contrast to classical dance, the movements are imaginatively arranged, mixing different styles of dance. Choreography of these dances range from simple to quite complex, and individual songs can differ from each other significantly according to style and music. This class is right for you if you like to watch Indian films and would like to learn to dance like Bollywood stars, but also if you just take pleasure in movement and would like to try something new while and exploring Indian culture and getting fit. The kids’ classes (for children between 6 and 10 years of age) combine dance, rhythm, music and yoga – essentially everything children find fun. The acting elements in Indian dance appeal to kids in particular. If you think your child is spending too much time in front of the computer or television and not enough time playing and being active, dance classes are a perfect way to encourage them to be active and best of all, they will be making friends and learning about a foreign culture while having fun! Bharatanatyam is based on an extensive theoretical background. Its knowledge helps to understand better all the aspects of the dance. Be it the confident application of the handgestures while interpreting a padam, or the knowledge of the various characters that can appear in a song. Be it the clear denomination of the applied movements and positions, a better understanding of South Indian music, or a knowledge of the rhythmic system and thus the precise composition of the single adavus and korvais.